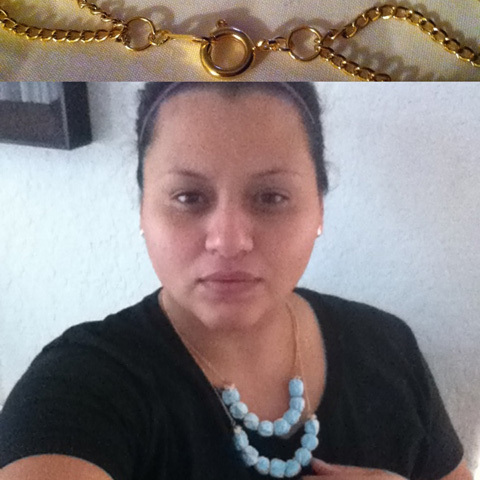 HOW TO: Mixed Material Necklace - Mexi-Style - Fueled by chile, frijoles & tortillas. As it must be pretty obvious by now, I love Do-It-Yourself crafts and pretty much just any projects in general. Lately, I have been on this jewelry-making kick, with a twist – re-purposing all sorts of items. I am not really sure why I like re-purposing so much, but I do. Maybe it has something to do with the fact that knowing things don’t have to stay and/or look the same, makes me feel content. For this project, I’ll be making a necklace with everyday items that can easily be re-purposed. I saw something similar to this jewelry piece and decided to make my own version for this post. First, Supplies: The jewelery-making items I used include needle nose pliers, wire cutters, and round nose pliers, any type of closing (I picked the spring ring clasp closing), two sets of jewelery caps (any kind you prefer), jump rings, 4 head pins, and a chain. Quick tip: You don’t have to, but I prefer having all my hardware for any one piece the same color, including the thread. Now let’s talk Beads on a string. Whether its hand strung or machine strung – I prefer machine strung since I don’t want to mess with the spacing when I wrap the thread around each bead – you’ll need some beads for this project as well. This is a great way to get rid of those Mardi Gras beads you’ve been holding on to. Fabric: I’m using fabric to wrap my beads. You can use the fabric of your choice for your necklace. If you want a more bulky look, use thicker fabric. For something smaller use a lighter fabric. In addition, you will also need embroidery thread (whatever color you like), a good pair of scissors, and glue (I am using E-6000, but you can use fabric glue if you prefer). The process: Cut two strands of the beads to the desired length. I cut mine about 3 inches long. Then cut four pieces of chain to the desired length (6 inches for me). Cut the fabric you picked about 2 inches longer than the strands of beads. Roll the beads in the fabric leaving about 1 1/2 inch on one side of your roll and about 1/2 an inch on the other side. Apply glue where the fabric meets and hold it in place until it becomes tacky enough for you to let go without it unraveling. Try not to let the fabric stick to the beads. I decided to add lace on top of my blue fabric following this same process. Once the glue is dry, wrap the string/thread around the first bead starting on the side with the 1/2 inch fabric and tie it off before moving to the next bead. Wrap string around each bead about 3 to 4 times. Once at the last bead, tie your thread off. Here you should notice you have a little excess fabric on each side, as well as one bead on each side that is not wrapped. Pull the fabric to expose your unwrapped bead and cut off exposed bead. Now, with a head pin wrap the fabric at the end of the last bead. You can use needle nose pliers to help bend and wrap your head pin. After wrapping your head pin twice, bend excess of pin up (see picture). Do the same for the other end of your wrapped beads. Cut off excess fabric. Now, insert a jewelry cap on each side. Next, use needle nose pliers to make a loop with the excess head pin, once your jewelry caps are in place. Make sure your head pin makes a complete loop – use round nose pliers for this step. Next, pull one small jump ring slightly apart to insert one chain and one end of the head pin loop you just made. Repeat the same process for other side of the wrapped beads using another chain of the same length. Repeat the entire process to the other wrapped beads. Position both necklace pieces on a flat surface, as pictured above (picture # 4), the way you would like the finished necklace to hang off your neckline. Cut off any excess chain with wire cutters. Pull apart a larger jump ring, insert both ends of your chain, as well as one end of a clasp. Repeat for the other side of your necklace (See picture #5).